The “Roller Coaster Capital of the World,” with sixteen coasters, Cedar Point is located in Sanduksy,Ohio, an hour drive from Cleveland. Encompassing 364 acres and incorporating the Soak City water park, Cedar Point is the second oldest continuously operating theme park in the country. It opened in 1870 and grew to be a mecca for coaster enthusiasts. On a Lake Erie peninsula, the park is beautifully scenic. With the addition of Gatekeeper in 2013, it has taken on a new appearance, as part of this coaster overhangs the entrance. 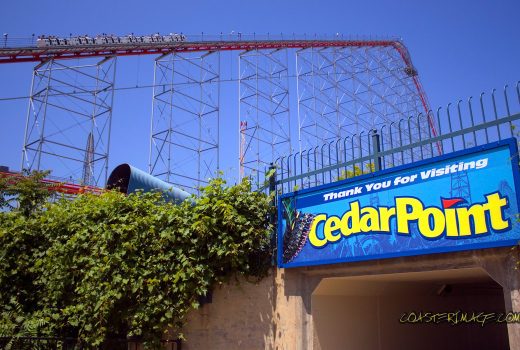 Cedar Point features some extreme thrill rides, most notably Millennium Force, one of only two Intamin giga coasters in existence as of 2013. (Although worldwide there are four full circuit coasters with a drop of at least 300 feet, the other manufacturers do not use this terminology.) Millennium Force offers a breathtaking view of Lake Erie on the left from the 310-foot cable lift hill and an even more breathtaking initial drop of 300 feet at an 80-degree angle. Other notable coasters are the wild and crazy Maverick, the 420-foot tall launch coaster Top Thrill Dragster which accelerates to 120mph in 4 seconds, the delightful inverted coaster Raptor and Magnum X-L 200, the first coaster to break the 200-foot barrier. For park guests who prefer something less extreme, there are a number of rides suitable for families and children. This theme park also features live entertainment and a wide selection of restaurants and food concessions, including those that cater to special dietary needs. It also offers Fast Lane access to rides for an upcharge and V.I.P tours with a personal guide and immediate access to rides, for a pretty hefty upcharge ($395 as of 2013).